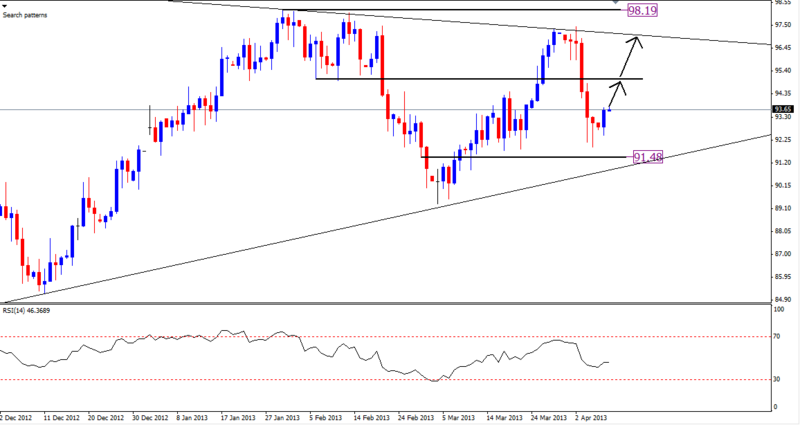 Crude technical outlook (09.04.2013) Crude still in tight range. You are here: Home / Commodities / Crude technical outlook (09.04.2013) Crude still in tight range. Crude (09.04.2013) traded both side as mention in last report. Now MCX Crude is trading around 5108 ($93.66) & as we can see on chart in last fortnight crude traded on both side & made a top of $97.43 & made a low of $91.93. However it was difficult to identify the 1st directional move & thus we stayed neutral. However there is no major change in technical picture , still we will try to catch some trade in this tight range movement. As we can see on charts, crude is bouncing from lower support area with some positive candlestick pattern , as well as getting support from indicators. based on above studies, we will prefer to go long for some possible upside targets around 5180 ($95) & then 5290 ($97.10). On the other hand 5020 ($91.90) & 4965 ($90.80) will act as major support. Can you please analyse the movement of JPYINR.